Here's a card I did for my friend Mindy.. she LOVES.. I MEAN LOVES, frogs! 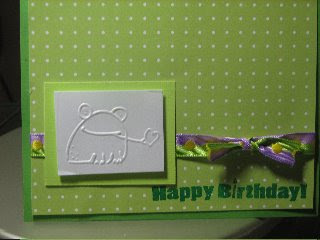 lol This is one of the very first cards I ever did... so yes.. it's VERY SIMPLE.. but she loved it. Inside reads.. "Hope your birthday is unFROGetable!"